One of the biggest fears for new runners (and particularly overweight and unfit runners) is the thought of running with someone else. Having someone else witness my red face, my inability to breath properly, having to walk every few minutes – oh the shame!! Nope. It’s easier to just go out alone. Well that’s how I felt for at least the first 5 or 6 years of my running journey. I had an irrational fear that if I ran with someone else I would be forced to run at their faster pace and show myself up. It was simply a control thing. Even when I signed up for races with friends I went out of my way to explain that I wouldn’t run more than the first 500 meters or so with anyone else. I just couldn’t take the pressure. All of that changed when I joined a running club. When you run with a club it’s inevitable that you have to run with someone else, and it tends to be the same someone else most of the time. For me the resident back runner at my club Dom. Joining a club was a drastic last resort option for me back in 2011 as I knew I had to increase my frequency, distance and speed of running in preparation for my first marathon, I couldn’t do it alone. However I still had this niggling concern that secretly the person stuck with me at the back thinks “oh no” as I poke my head around the door on club night. In the last few months though my thoughts on this have changed somewhat, and this because the shoe is on the other foot now. I now run fitness sessions for others, I make plans to ensure anyone can participate regardless of their ability, I run at the pace of people that are slower than me. Now I know that in this context I am being paid to do that supporting role, but even when I ran with two of my sisters in their first races it felt good to be focussed on their goals not mine. Too often we make assumptions about what others are thinking and feeling about a situation and this holds us back. Yesterday I read a story about two teenage sisters in America who were competing in a track race. 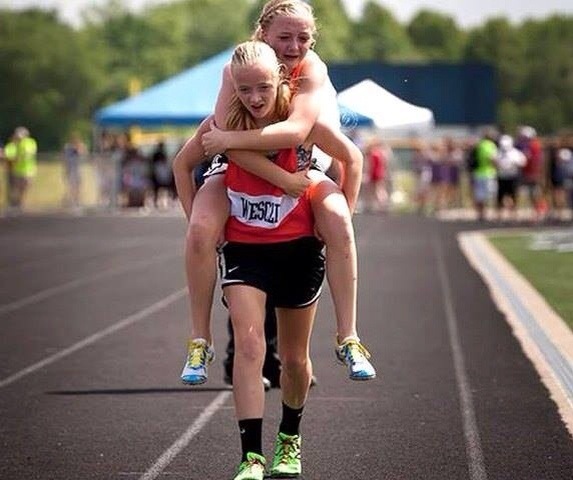 One of the girls sustained an injury while running and couldn’t continue, so her twin forfeited her race and carried her sister on her back so they could both finish. The moral is clear to see. But remember in life there is a time to receive support and a time to give it. Don’t be held back by irrational fear, giving someone the opportunity to support is a gift and it will be as rewarding for them as it is beneficial to you. Don’t be one of those “I can only run alone” people forever, be bold, reach out, take a chance find yourself a buddy, join a club, sign up for a retreat who knows how your running and your resolve will improve as a result. ← Fast versus Fun…the “Proper Runner” saga continues. This definitely applies to me! I’m a new runner – 6 months now. 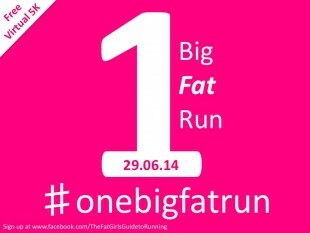 I’m really enjoying it and have run a few 5k’s, an 8k and a 10k. I’m slow but steady, and improving every run. All on my own so far. I’m a lone runner and I say to myself that I prefer too. I don’t want to hold anyone back. The only thing I really miss out on is having someone to hang out with pre or post race. So I may just take your advice and be bold and join a club! Thank you! Go for it. Don’t get me wrong it takes a bit of getting used to, but once you have faced your fear there’s no turning back. Where are you based?? Well, I’ll try at least once 🙂 I’m in Ottawa, Canada now … Used to live in Luton, Bedfordshire though! This post has totally reminded me of what I was like when I started running. Me and my boyfriend signed up for a 5k in January last year and I point blank refused to let him see me running. It was at the point where we would train at the same time but I would run in the opposite direction to him so he wouldn’t see me! I didn’t really run again after the 5k until January this year when I joined a beginners 0-5k group and then a 5-10k group. It took 15 weeks of running with people at the running group before I realised that I actually liked running with other people and let my boyfriend pace me round a Parkrun which went a long way to me being able to go sub 30 minutes..
I’d recommend to anyone to go to a running group/club as generally everyone is really nice and welcoming and more and more are running beginner classes. I’ve made so many new friends and we’ve even started a little group on facebook where we say when we’re planning to go running and 90% of the time someone will end up coming along too. P.S. love what you’re doing with this blog! It really inspired me when I started running again and showed me that you don’t need to be stick thin to be able to run and that fat girls can run too! Great post. Commando is always more concerned by the people overtaking him rather than the slower runners. He has run as back marker for the park run occasionally and found it very rewarding. I always find myself running on my own even in a chuffing marathon… I think it’s because I smell. One day, Marathon Talk…tomorrow… the world! I just have one question. How do I show this blog to my girlfriend in a polite way? Great question. Perhaps show her one of my posts about how to chose running shoes or something not weight or fitness related. Good Luck, ultimately she will start her journey when she is ready.